Posted 2 years ago on Wednesday, November 30th, 2016 by James S.
When I was making a router table extension for my table saw, I was using my Black and Decker RTX to cut u-bolts in half for DIY fence clamps. 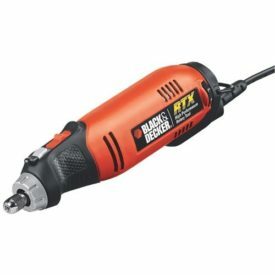 The RTX is a knockoff Dremel tool. It takes the same attachments and works nearly identically, except it only costs about $30 and so far I’ve found it to be better built after burning out my “real” Dremel that cost a good bit more. At some point after cutting a good bit of metal, the tool started going full speed, no matter what the speed setting was set to. I knew I could replace it for another $30, but it was worth taking a look and seeing if it could be fixed first. If you unscrew the visible screws on the RTX, the plastic parts pull off and you’re left with a big control board. I would imagine a real Dremel is disassembled similarly. 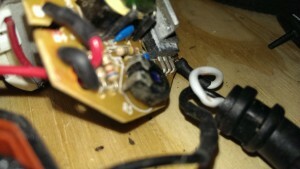 The speed control is the small potentiometer shown in the picture. It ended up that enough metal shavings got embedded between the two contacts to the potentiometer to bridged it so it was permanently on. A little bit of electrical contact cleaner fixed it right up. For whatever reason, I have no video of any other things I’ve done in this process, but I do have video of the speed control working after fixing it. On an unrelated note, I highly recommend the Black and Decker RTX instead of a regular Dremel. I got it for $30 after burning out my name-brand Dremel cutting metal with a cutoff wheel (kinda familiar)… but in that case it bound up and fried the motor irreparably. Or at least it wasn’t worth fixing. This one has had the exact same thing happen, since it’s pretty easy to get a cutoff wheel to bind in a length of metal, but it has kept on trucking.